This is our signature fleece photo blanket. 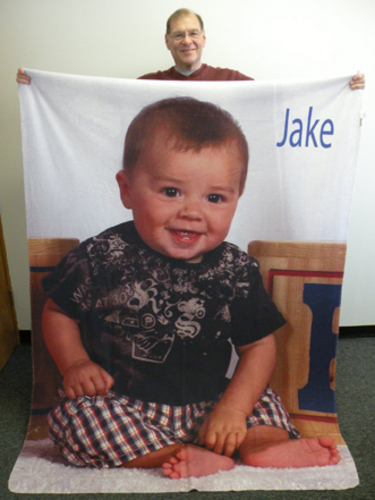 Using the latest in printing and production technology, your photo is dyed on a soft fleece fabric. The end result is extensive life of the print and same feel as the fabric. The print will not peel or flake or fade out. The soft polar fleece material is safe against all allergies and machine washable. You won't find a sharper, more vividly colored custom photo blanket than ours. An excellent Mother's Day gift, Father's Day gift, Birthday gift, Wedding gift, Graduation gift, Family Reunion Photos gift, or for you. Backed by our 100% satisfaction guarantee. Available in three sizes.